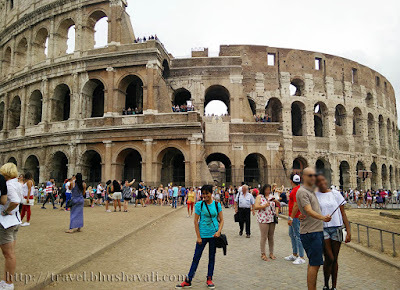 I went on a solo backpacking trip to Italy for 3 days which began with Rome and ended with Milan and the first place I visited in Rome was Colosseum. Colosseum - I had seen it drawings, photos and videos since childhood as I grew up. It was one of the important topics in my uni days in art history. Honestly till 2014, I had absolutely no clue I'd be able to travel to Europe. But then there I was with my Schengen Visa and there I saw one of the Medieval 7 Wonders of the World with my own eyes!!! This was built by Vespasian in 72 AD and was inaugurated in 80AD and the cost of construction came from the loots of Jewish war. It was a super structure for the era with a height of 157ft and circumference of 1788ft. Covering an area of 620ft x 513ft, and central arena of 287ft x 180ft, it comfortably fits a football field. With 4 floors, varying in height from 34ft to 47ft, and each floor having 80 arches, it could hold 50,000 spectators at any given point of time. The first row of seating was at 15ft from the arena floor. It was not just a 4 floored building but also has a under ground floor & tunnels that held prisoners and animals. This was in active use till 6th C CE after which it went to disuse and got damaged in earthquakes and got quarried for other constructions. However the ruins of its outermost wall can be still seen on the other side of the road!! I chose not to get into the Colosseum to save time to explore other places. Just a few steps from it was the Arch of Constantine. This was built in 315CE by Constantine I. This was built to commemorate Constantine’s victory at the Battle of Milvian Bridge. Though its big at 21m height & 25m width, its size is eaten up by Colosseum. There is a huge inscription in the top part of the arch that mentions his victory. There are 10 medallions of which 8 were originally from the Hadrian Monument which belonged to the 1st & 2nd C CE which do not exist today. There are 8 human sculptures on the topmost panel and 6 reliefs as well. Just below the medallion are some friezes. There are also some panels in the walls of the arches. Though the Arch is open to view any time, free of cost, its not possible to go into the arches or touch them. There's a fencing all around it. A lot more on the places I saw in Rome and rest of backpacking across Italy coming up. Stay tuned. Free entry during first Sunday of every month. At any given point of time there can only 3000 people inside the monument so its pretty much impossible to get the ticket there. So pre-book as early as possible. The best way to explore Rome is by taking the 1 day transport pass. Though Vatican is a separate nation and not a part of Rome, don't worry, for all practical purposes, the Roman Visa and this transport pass is enough to access Vatican. Water costs soooo much! Half a litre of water costs 2 Euros anywhere here. Wherever you're staying, try to fill up your bottles there before you set your foot out. Thanks for sharing your tips for Rome. Especially about the tickets and water cost. I went there in 2006 and I remember it being like that. The pictures brought back som great memories for me so thanks for sharing! What an adventure! We took the kids on their very first international experience. We loved it, as you did!! Thanks for all the tips and information. Your photos are lovely!! Perfect for daydreaming of a visit to Rome! Yes, the Colosseum is a magical place to explore. I found it incredible that a place so old was still standing today. If the walls could talk, the incredible stories you'd hear. Thanks for sharing your tips! The colosseum is such an interesting place to visit and your pictures are bringing back a lot of memories. So true about the cost of water haha, did you see any of the fountains for drinking water? They are a life saver! I love the architecture of the Colosseum, but didn't know much about its history. I can't believe it could hold 50,000 people! And to think they had all sorts of wild animals there as well! This brings back great memories for me. We went to Rome several years ago and I was blown away by the Colosseum and the Roman Forum. Great tips too about buying tickets in advance. I wished I would have known that before we went and stood in line for an hour! Ha! Thanks for bringing back memories of our honeymoon in Rome. Seeing the Colosseum for the first time was also an awesome moment for me and my wife. The sense of history in Italy is simply so palpable. I am inspired to travel solo in Europe too after reading your article. I still need to apply for a Schengen visa. I hope that the process will be okay. I like to visit Italy. There are so many tourist destinations that I want to see like the Colosseum. There is so much history. I have seen that in so many photos and movies. I have seen Colosseum many times on the history books and TV, but I forget so much of its history. I did not know that the funds for building the Colosseum were coming from the Jewish War. Thanks for offering info and tips for getting real tickets and the monument, and $2 for a bottle of water is indeed very expensive. Ah man I'm so jealous. Rome has been on my bucket list for years. I admire you for traveling there alone. Looks like you had a lovely time. The city is so rich with history! You are lucky you get to see this iconic landmark for yourself! I've always wanted to go and thanks for your insights, I can take those with me on my travel there on the future. Your photos are beautiful and capture just how awe-inspiring this structure is! More than the photos of the majestic Colloseum, i love your tips better! they are so useful, esp the tip about water and the tickets. i hope I get to see these soon! I just checked if the Colosseum was a UNESCO site and although it's not, the whole historic center of Rome is, so technically the Colosseum is? I visited the Colosseum quite a few years ago and was disappointed with inside so you didn't miss anything, actually I only went inside because a Bruce Lee and a Van Damme movie were filmed there. Water is expensive at 2 euros a bottle, I think risked the tap water there. This is still on my list! I was pretty surprised to read that "ONLY" 3000 people are allowed in at once - that sounds like a big number to me but I guess with how big it is, that's not a lot. Thanks for including the website for buying tickets online. I know I would've gotten confused about which site is real and which is fake. I was so underwhelmed by the Colosseum when I went, I couldn't wait to leave. The tour was so long that we left our group and just explored our self. I guess since I am not a history buff or lover of architecture I just don't have an appreciation for this. To each their own though. Great post!! I remember when we visited the Colosseum, the place was packed because there were some sort of parade going on. Which made us return the following day early morning to get a good view of it and enjoy it with less crowd. 2 Euros for half a litre of water? How will I ever travel to Europe if water is gold there?! You have given fine description of the Colosseum and the Arch Of Constantine and attached great pictures! I wish you had more than 3 days for this trip! What a magneficient structure! Visiting the Colosseum has been a long time dream, it has so much history and beauty. I also enjoyed Rome and the Colosseum - I was lucky to get in just by standing in the line and buy the ticket right there... Although I dislike overcrowded places, I must admit Rome and the Colosseum are so impressive! It's a must see! I look forward to reading the rest of your posts on Rome. I cherished my time at the Colosseum. I felt like I was walking back into history. So seeing your photos reminded me of that feeling all over again. This one is on my list from a long time because of the beautiful architecture and design it has with a history. Who wouldn't want to visit the colosseum. I am hoping that one day, Ill have eurotrip of my own too. Rome is a mecca for massive medieval architecture. Hope to visit there soon! I've heard about Colosseum that crowd acts like cattle. Is it true? When in Rome, do as the Roman does! I hope to have a closer look at the human sculptures! Do you have a close-up photo of it or is the one you posted the clearest? Rome is an awesome place and has so much to offer! Your post is very informative! Even I have been watching this pic since childhood and sooo want to visit it. Water so costly?! Hmmm, good to know and keep in mind. I really envy you for you have been traveling a lot to the different countries. I have never been to Italy yet and this post remind me of my long dream to visit that Colosseum for I have seen that one since when I was in grade school. Thank you so much for sharing this with us. Someday, I get to visit this as well. Thank you for inspiring me.